This makes approximately 6 servings. 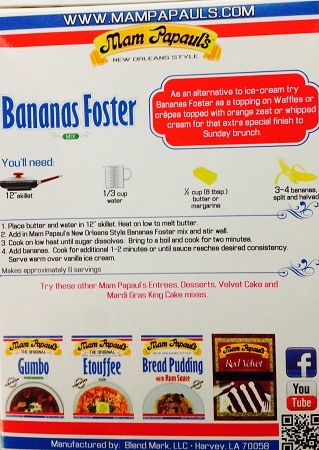 World Famous Mam Papaul's Bananas Foster Mix. Easy to prepare. Enjoy this New Orleans dessert right in your own home. Great tasting. As an alternative to eating with ice cream, you can add as a topping on Waffles or crepes for that extra special finish to Sunday Brunch. Cooking Directions: Place butter and water in 12' skillet. Heat on low to melt butter. 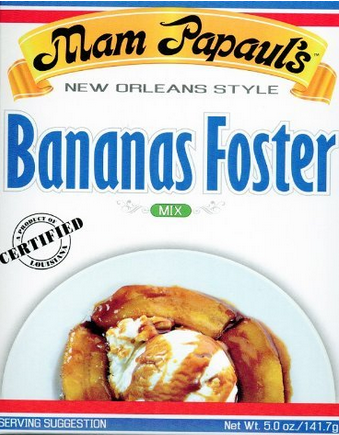 add in Mam Papaul's Bananas Foster mix and stir well. Cook on low heat until sugar dissolves. Bring to boil and cook for 3 minutes. Add bananas. Cook for 1-2 additional minutes or until sauce reaches desired consistency. Serve warm over vanilla ice cream.